The Amazon Kindle is a series of e-book readers designed and marketed by Amazon.com. Amazon Kindle devices enable users to shop for, download, browse, and read e-books, newspapers, magazines, blogs, and other digital media via wireless networking. 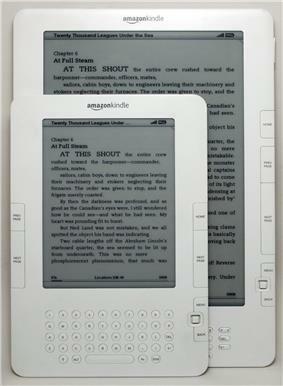 The hardware platform, developed by Amazon.com subsidiary Lab126, began as a single device and now comprises a range of devices, including dedicated e-readers with E Ink electronic paper displays, and Android-based tablets with color LCD screens. There are currently about 3 million books in the Kindle book store. The Kindle name was devised by branding consultant Michael Cronan who was asked by Lab 126 to name the product. Cronan and partner Karin Hibma suggested Kindle, meaning to light a fire. They felt this was an apt metaphor for reading and intellectual excitement. Kindle hardware has evolved from the original Kindle introduced in 2007 and a Kindle DX line (with a larger screen) introduced in 2009. The range now includes devices with a keyboard (Kindle Keyboard), devices with touch-sensitive screens (Kindle Paperwhite), a tablet computer with a reader app and a color display (Kindle Fire), and a low-priced model with an on-screen keyboard (Kindle). Amazon has also introduced Kindle software for use on various devices and platforms, including Microsoft Windows, iOS, BlackBerry, Mac OS X (10.5 or later, Intel processor only), Android, webOS, and Windows Phone. Amazon also has a "cloud" reader to allow users to read and purchase Kindle books from a web browser. Amazon released the Kindle, the first generation Kindle device on November 19, 2007, for US$399. It sold out in five and a half hours. The device remained out of stock for five months until late April 2008. It is the only Kindle with expandable storage, via an SD card slot. The device features a 6 inches (diagonal) 4-level grayscale display, with 250 MB of internal storage, which can hold approximately 200 non-illustrated titles. It also has a speaker and headphone jack that allows the user to access audio files on Kindle. The device's Whispernet feature was co-designed with Qualcomm, and Kindle was the first device to include free nationwide 3G access to download books from the Amazon web store. Amazon did not sell the first-generation Kindle outside the United States. On February 10, 2009, Amazon announced the Kindle 2. It became available for purchase on February 23, 2009. The Kindle 2 features a text-to-speech option to read the text aloud, and 2 GB of internal memory of which 1.4 GB is user-accessible. By Amazon's estimates, the Kindle 2 can hold about 1,500 non-illustrated books. Unlike the first-generation Kindle, Kindle 2 does not have a slot for SD memory cards. It was slimmer than the original Kindle. According to an early review by iFixIt, the Kindle 2 features a Freescale 532 MHz, ARM-11 90 nm processor, 32 MB main memory, 2 GB moviNAND flash memory and a 3.7 V 1,530 mAh lithium polymer battery. On July 8, 2009, Amazon reduced price of the Kindle 2 from the original $359 to $299. On October 7, 2009, Amazon further reduced the price of the Kindle 2 to $259. The Kindle 2 had a manufacturing materials cost estimated at $185.49, in 2009 by iSuppli. On October 22, 2009, Amazon stopped selling the original Kindle 2 in favor of the international version it had introduced earlier in the month. On November 24, 2009, Amazon released a firmware update for the Kindle 2 that it said increased battery life by 85% and introduced native PDF support. The original Kindle 2 used CDMA2000 for use on the Sprint network. The international version used standard GSM and 3G GSM, enabling it to be used on AT&T's U.S. mobile network and internationally in 100 other countries. The international version of the Kindle 2 is believed to have a noticeably higher contrast screen, although Amazon does not advertise this. Another review done by Gadget lab, disputes this and actually states that the font appears to be fuzzier than that of the first generation kindle. The review goes on to say that changes to the Kindle 2 have made it tougher to read the smaller font sizes that most books use. Writers on another website discuss how the font size is at times worse than that of the first-generation Kindle. It appears that whether the Kindle 2 is clearer or fuzzier than the prior model depends on the font size. These issues became moot when Amazon sourced a higher contrast E Ink technology it dubbed "E Ink Pearl" and which it used in all of its e-reader devices thereafter. On October 22, 2009, Amazon lowered the price on the international version from $279 to $259 and discontinued the U.S.-only model. On June 21, 2010, hours after Barnes & Noble lowered the price of its Nook, Amazon lowered the price of the Kindle 2 to $189. Since January 19, 2010, the Kindle DX International has shipped in 100 countries. The Kindle DX comes with a 9.7-inch E Ink screen instead of the 6-inch Kindle screen. It has support for international 3G wireless, and its serial number will start with "B005". 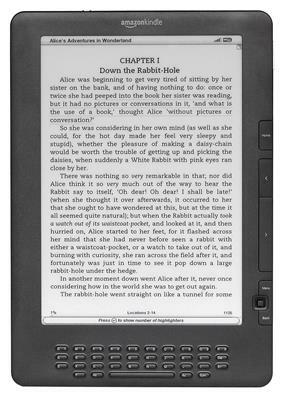 On July 1, 2010, Amazon released the Kindle DX Graphite, a revision of the DX. As well as dropping the price from $489 to $379, the new Kindle DX has an E Ink display with 50% better contrast ratio (due to new E Ink Pearl technology) and comes only in a "graphite" case color. It is speculated the case color change is to improve contrast ratio perception further, as some users found the prior white casing highlighted that the E Ink background is light gray and not white. Like the prior Kindle DX, it does not have a Wi-Fi connection. Its serial numbers start with "B009". 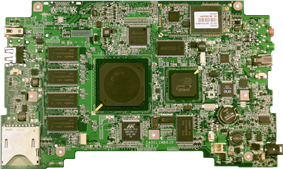 The DX Graphite (DXG) is a mix of third-generation hardware and second-generation software. The CPU is of the same speed as Kindle 3 but is of a different revision. Even though DX Graphite has a larger case, it has only a half the system memory (128MB) of the Kindle 3 (256 MB). Due to these hardware differences, the DX Graphite runs the same firmware as Kindle 2. Therefore, DX Graphite cannot display international fonts (such as the Cyrillic font, Chinese, or any other non-Latin font), and PDF and the web browser are limited to Kindle 2 features. The Kindle DX was withdrawn from sale in October 2012, but in September 2013 was made available again in the US and internationally, with the 3G data free to access the Kindle Store and WorldHeritage. Loading personal documents by USB is free, but sending them via 3G is about $1 per megabyte in Ireland. It has battery life of about one week with 3G and two to three weeks with wireless off. It does not have WiFi capabilities. Text to Speech and MP3 playback are supported. 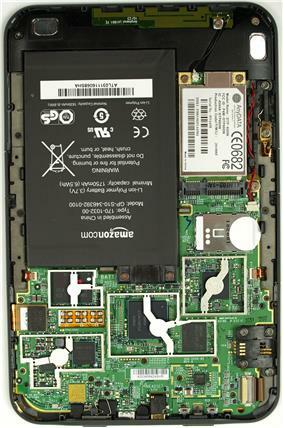 Inside the third generation Kindle (w/ 3G option) - back cover removed. Amazon announced the third generation of the Kindle, later called the Kindle Keyboard, on July 28, 2010. While Amazon does not officially add numbers to the end of each Kindle denoting its generation, reviewers, customers and press companies often refer to this updated Kindle as the "K3" or the "Kindle 3". 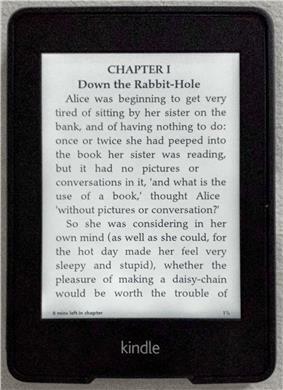 The third generation Kindle had a 6 inches (15 cm) screen with a resolution of 600x800 (167 PPI). The Kindle Keyboard is available in two versions. One of these, the Kindle Wi-Fi, was initially priced at $139 / GB£111 and connects to the Internet exclusively via Wi-Fi networks. The other version, considered a replacement to the Kindle 2, was priced at $189 / £152 and includes both 3G and Wi-Fi connectivity. (currently unavailable in UK ) The built-in free 3G connectivity uses the same wireless signals that cell phones use, allowing it to download and purchase content from any location with cell service. 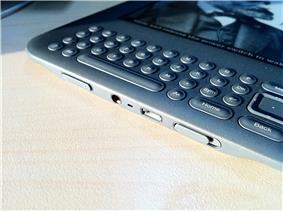 The Kindle Keyboard with 3G is available in two colors: classic white and graphite. Both models use the newer E Ink "Pearl" display, which has a higher contrast than prior displays and a faster refresh rate. However, it remains slower than traditional LCDs. The Kindle Keyboard uses a Freescale i. MX353 applications processor, Freescale MC13892 power management chip, Epson E INK controller, and Samsung DRAM and flash. Other hardware changes include a larger 1,750 mAh lithium-ion polymer battery, AnyDATA DTP-600W 3G GSM modem, and Atheros AR6102G 802.11bg Wi-Fi chip. The third-generation Kindle is 0.5 in shorter and 0.5 in narrower than the Kindle 2. It supports additional fonts and international Unicode characters and has a Voice Guide feature with spoken menu navigation. Experimental features include a browser based on the popular WebKit rendering engine (but browser may be limited to 50MB of 3G per month to web sites other than Amazon and WorldHeritage in territories outside of the United States), Text-to-Speech that can read aloud the text from books and other content, and an MP3 player. Internal memory is expanded to 4 GB, with approximately 3 GB available for user content. Battery life is advertised at up to two months of reading half an hour a day on a single charge with the wireless turned off, which amounts to roughly 30 hours. Amazon began accepting pre-orders for the new Kindle as soon as it was announced and began shipping the devices on August 27, 2010, in the United States and United Kingdom. With the announcement of the Kindle Keyboard, Amazon also launched an Amazon.co.uk version of the Kindle store. On August 25, 2010, Amazon announced that the Kindle 3 was the fastest-selling Kindle ever. The Kindle Keyboard generally received good reviews after launch. In their Kindle Keyboard Review, Review Horizon describes it as offering "the best reading experience in its class" while Engadget states, "In the standalone category, the Kindle is probably the one to beat". 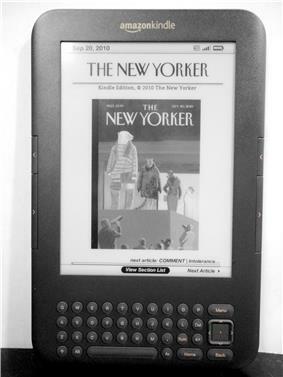 After the introduction of the low priced Kindle version, and Kindle Touch and Kindle Fire readers in September 2011 Amazon began describing the older Kindle version as the 'Kindle Keyboard' instead of the Kindle 3. At the time, 3G is not available for all countries. Amazon announced the fourth-generation Kindle on September 28, 2011 ($79 ad-supported, $109 no ads). Retaining the 6 inch e-ink display of the previous Kindle model as well as Amazon's experimental web-browsing capability with Wi-Fi, the fourth-generation Kindle features a slight reduction in weight and size in a silver-grey bezel, as well as nine hard keys, a cursor pad, an on-screen rather than physical keyboard, a flash storage capacity of 2 GB, and an estimated one month battery life. Amazon announced a touchscreen Kindle, called the Kindle Touch, on September 28, 2011, available with Wi-Fi ($99 ad-supported, $139 no ads) or Wi-Fi/3G connectivity ($149 ad-supported, $189 no ads). Via 3G the device is able to connect to the Kindle Store, download books and periodicals, and access WorldHeritage. Experimental web browsing (outside of WorldHeritage) on Kindle Touch 3G is only available over Wi-Fi. (Kindle Keyboard continues without this restriction). The usage of the 3G data is limited to 50MB per month. The device uses the same 6 inch E-ink screen of the previous Kindle model, with the addition of an infrared touch-screen control. Like its predecessor, the Kindle Touch has a capacity of 4 GB and battery life of two months. The Kindle Touch began to ship on November 15, 2011 (U.S. only). Amazon announced in March 2012 that the device would be available in the UK, Germany, France, Spain and Italy on April 27, 2012. In January 2013, Amazon released the 5.2.0 firmware that updated the operating system to match the Paperwhite's interface with the Touch's MP3/audiobook capabilities remaining. Amazon announced a new version of the regular Kindle and the Kindle Paperwhite on September 6, 2012. The Kindle 5 was released on September 6 ($69 ad-supported, $89 no ads). The Kindle has a black bezel (compared to the Kindle 4, which was available in silver-grey), better contrast, and hand-tuned fonts. It is claimed to have 15% faster page loads. It has a 167 PPI display and is the lightest Kindle at 5.98 oz (170 g). Amazon spokesman Drew Herdener stated that the company is "... changing our systems so that in the future we will not remove books from customers' devices in these circumstances." On July 23, 2009, Amazon CEO Jeff Bezos posted an apology about the company's handling of the matter on Amazon's official Kindle forum. Bezos said the action was "stupid", and that the executives at Amazon "deserve the criticism received." For copies of Works purchased pursuant to TOS granting "the non-exclusive right to keep a permanent copy" of each purchased Work and to "view, use and display [such Works] an unlimited number of times, solely on the [Devices]... and solely for [the purchasers'] personal, non-commercial use", Amazon will not remotely delete or modify such Works from Devices purchased and being used in the United States unless (a) the user consents to such deletion or modification; (b) the user requests a refund for the Work or otherwise fails to pay for the Work (e.g., if a credit or debit card issuer declines to remit payment); (c) a judicial or regulatory order requires such deletion or modification; or (d) deletion or modification is reasonably necessary to protect the consumer or the operation of a Device or network through which the Device communicates (e.g., to remove harmful code embedded within a copy of a Work downloaded to a Device). 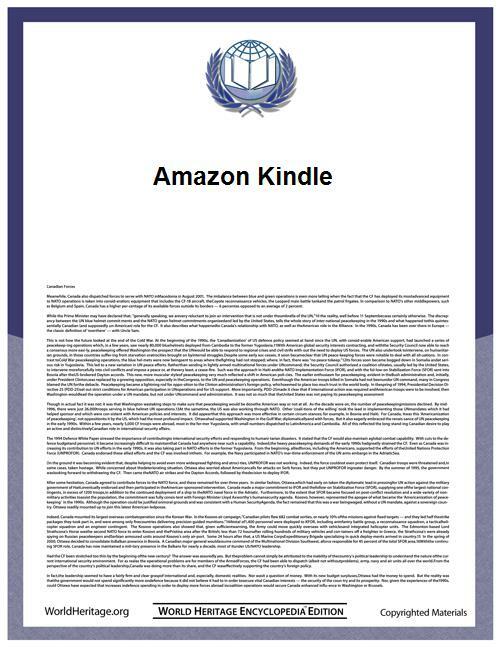 On September 4, 2009, Amazon offered affected users a restoration of the deleted e-books, an Amazon gift certificate, or a check for the amount of $30. In December 2010, three e-books by author Selena Kitt were removed due to violations of Amazon's publishing guidelines. For what Amazon describes as "a brief period of time," the books were unavailable for redownload by users who had already purchased them. This ability was restored after it was brought to Amazon's attention; however, no remote deletion took place. In October 2012, Amazon deleted every book that Linn Nygaard, an IT consultant living in Norway, had purchased, and canceled her Amazon account. Amazon claimed that she had violated their terms of service, but was not specific as to what she had done wrong. The next day Amazon restored her account and books. ^ "Amazon Kindle 1st-gen review". gdgt. Retrieved 2013-09-03. ^ Dudley, Brier (November 19, 2007). "Kindle hacking, iPod parallels and a chat with the Kindle director". Seattle Times. Retrieved December 28, 2010. ^ "Kindle Wireless Reading Device - 2nd Generation". Amazon.com. Archived from the original on August 9, 2010. Retrieved August 14, 2010. ^ "Kindle for iPhone home page". Archived from the original on February 5, 2010. Retrieved December 30, 2009. ^ Kafka, Peter. "That Was Fast: Kindle, Meet the iPhone.". Retrieved December 30, 2009. ^ , Exclusively on Amazon's Kindle"UR". StephenKing.com. Self-published. Archived from the original on February 12, 2009. Retrieved February 10, 2009. ^ Slattery, Brennon (April 22, 2009). "Amazon's $359 Kindle 2 Costs $185.49 to Build". ^ "Does the new Kindle have better contrast?" - by David Carnoy – cnet Reviews – November 10, 2009 - © 2010 CBS Interactive. All rights reserved. ^ "Kindle 2’s Fuzzy Fonts Have Users Seeing Red" - By Priya Ganapati – Gadget Lab April 13, 2009 - Wired.com © 2011 Condé Nast Digital. All rights reserved. ^ a b c "Help: Kindle (2nd Generation) and Kindle DX Software Updates". Amazon.com. Retrieved 2014-04-15. ^ Loeffler, Shawn (August 6, 2010). "Amazon Kindle 3". ^ Pogue, David (August 25, 2010). "New Kindle Leaves Rivals Farther Back". ^ "Kindle Paperwhite e-reader announced, $119 Wi-Fi and $179 3G models ship October 1st". The Verge. 2012-09-06. Retrieved 7 September 2012. 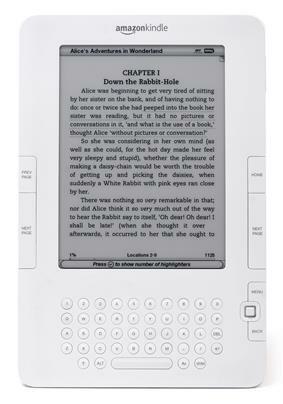 ^ "Kindle Paperwhite – Touch Screen Ereader with Built-In Light". ^ "Amazon Admits That the Kindle Paperwhite Has Some Problems". US: Gizmodo. 10-12-2012. Retrieved 2013-08-28. ^ "Amazon’s Next Kindle Paperwhite Leaks Early, Now Available To Pre-Order For U.S. Shoppers". TechCrunch. 2011-01-04. Retrieved 2013-09-03. ^ Laura Hazard Owen. "Amazon’s new high-end e-reader, the Kindle Voyage, starts at $199 but has fancy page turns". ^ "亚马逊Kindle Voyage电子书阅读器 全新智能调节阅读灯、创新【压敏式翻页键】、高分辨率、高对比度、内置WiFi" (in Chinese). ^ a b c "Amazon unveils Kindle Fire HDX alongside new $139 Kindle Fire HD". BGR. ^ Islam, Zak. "Amazon Selling Kindle Fire HD, Paperwhite at Cost". Tom’s hardware. Retrieved 2013-08-28. ^ "Amazon’s Answer To Apple’s Terms: A Web-Based Kindle Cloud Reader – Brilliant On PC, Better On iPad". TechCrunch. August 9, 2011. Retrieved August 18, 2011. ^ "Kindle Cloud Reader Opens Up Options for Linux and iPad Users". Ostatic.com. Retrieved 2014-05-12. ^ .. "Amazon.com Announces Fourth Quarter Sales up 42% to $9.5 Billion". Business Wire. January 28, 2010. Retrieved December 2, 2010. ^ Thomas Claburn (April 7, 2012). "iPad Mini: 6 Reasons Apple Must Do It". ^ "NetFront Browser Gives Amazon Kindle Customers On-Device Access to Information-Rich Websites like WorldHeritage.org". ^ Hastings, Rob (January 1, 2011). "Amazon allows customers to lend e-books to just one friend". ^ "Kindle Books: Kindle Store : Nonfiction, Fiction, History, Advice & How-to, Business & Investing & More". Amazon.com. Retrieved August 18, 2011. ^ "Kindle Books: Kindle Store : Nonfiction, Fiction, History, Advice & How-to, Business & Investing & More". Amazon.com. Retrieved July 23, 2011. ^ Ricker, Thomas (November 19, 2007). "Amazon Kindle available now on Amazon". Engadget.com. Archived from the original on November 22, 2007. Retrieved November 21, 2007. ^ Allen, Katie (December 28, 2009). "Amazon e-book sales overtake print for first time". The Guardian (London). Archived from the original on December 31, 2009. Retrieved December 28, 2009. ^ "Dictionaries & Thesauruses: Kindle Store : Thesauruses, Kindle Default Dictionaries & More". Amazon.com. Retrieved August 18, 2011. ^ "Help: Customize Your Reading". Amazon.com. Retrieved August 18, 2011. ^ Amazon is testing “Kindle Unlimited,” an ebook subscription service for $9.99/month. Retrieved 16 July 2014. ^ "Kindle Publishing Programs". Amazon.com. July 12, 2011. Retrieved August 18, 2011. ^ Kindle Format 8, Amazon.com, October 2011. ^ "List of supported HTML tags and CSS elements". Amazon. Retrieved 4 August 2012. ^ "The New Kindle Format KF8". Musings and Marvels:Learning the ins and outs of the publishing industry. March 6, 2012. Retrieved March 16, 2012. ^ "Amazon Throws A Minor Curveball With HTML5-Powered Kindle Format 8", TechCrunch, October 20, 2011. ^ Amazon (2009). "Amazon.com: Kindle 2: Amazon's New Wireless Reading Device (Latest Generation): Kindle Store". Amazon. Archived from the original on March 5, 2009. Retrieved March 7, 2009. ^ "Kindle User Guide" (PDF). Amazon.com. Archived from the original on February 6, 2009. Retrieved February 7, 2009. ^ "Amazon Announces Kindle Development Kit--Software Developers Can Now Build Active Content for Kindle". ^ Johnson, Alex (January 26, 2010). "Amazon to launch app store for Kindle e-reader". ^ "Products tagged with kindle active content". Amazon.com. Retrieved 2014-04-15. ^ a b Munarriz, Rick Aristotle (November 27, 2007). "Why Kindle Will Change the World". ^ "Amazon Kindle Direct Publishing: Get help with self-publishing your book to Amazon's Kindle Store". Kdp.amazon.com. Retrieved 2014-04-21. ^ Frommer, Dan. "Bad News for the Kindle: iPhone 3G + Apps (AAPL, AMZN)". BusinessInsider.com. pp. "Silicon Alley Insider" section. Archived from the original on March 9, 2009. Retrieved March 6, 2009. ^ "Kindlenomics Zero: When e-Texts Have No Entry Cost". ZDNet.com. pp. "Tech Broiler" blog. Retrieved March 6, 2009. 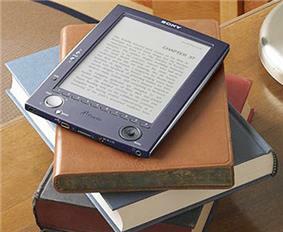 ^ "Gizmodo – Amazon Kindle and Sony Reader Locked Up: Why Your Books Are No Longer Yours – Amazon:". ^ "Kindle owners find out about DRM's ever-present threat – Ars Technica:". Gear & Gadgets. Ars Technica. April 16, 2009. Archived from the original on June 22, 2009. Retrieved July 4, 2009. ^ "Fifty Shades Of Grey first to sell a million copies on Kindle". June 27, 2012. ^ "Kindle Publishing Now Open To All Blogs". TechCrunch. 2009-05-13. Retrieved 2014-04-15. ^ "Kindle Publishing for Blogs". Kindlepublishing.amazon.com. Retrieved 2014-07-02. ^ Pogue, David (July 17, 2009). "Some E-Books Are More Equal Than Others". The NY Times (blog). Archived from the original on July 9, 2011. Retrieved August 18, 2011. ^ Fowler, Geoffrey A (July 30, 2009). "Lawsuit: Amazon Ate My Homework". ^ "'"Amazon settles lawsuit over deleted Kindle copy of '1984. Tech flash. September 30, 2009. Archived from the original on April 24, 2011. Retrieved March 19, 2011. "Teardown of the Amazon Kindle", (You tube) (video), Google http://www.youtube.com/watch?v=lD-wPmowR-Y . As of July 2014, the program status is listed as beta. Amazon, not the publisher, sets the monthly subscription rate for each blog between $0.99 - $1.99. Since the blogs may contain pictures, and wireless 3G access requires no monthly subscription fee, Amazon retains 70% of the revenue from blog sales, remitting 30% to the content publisher. Blogs published by popular media outlets such as TechCrunch and Ars Technica have been available on Kindle as early as 2008. In May 2009, the program was opened to everyone. Amazon has reported the Kindle version of Fifty Shades of Grey sold more than double that of Amazon's print sales of the book, and, in June 2012, the Kindle edition became the first to sell more than one million copies. Other criticisms involve the business model behind Amazon's implementation and distribution of e-books. Amazon introduced a software application allowing Kindle books to be read on an iPhone or iPod Touch. Amazon soon followed with an application called "Kindle for PCs" that can be run on a Windows PC. Due to the book publishers' DRM policies, Amazon claims that there is no right of first sale with e-books. Amazon states they are licensed, not purchased; so unlike paper books, buyers do not actually own their e-books according to Amazon. This has, however, never been tested in court, and the outcome of any action by Amazon is uncertain. The law is in a state of flux in jurisdictions around the world. In a December 5, 2009 interview with The New York Times, CEO Jeff Bezos revealed that Amazon.com keeps 65% of the revenue from all ebook sales for the Kindle. The remaining 35% is split between the book author and publisher. After numerous commentators observed that Apple's popular App Store offers 70% of royalties to the publisher, Amazon began a program that offers 70% royalties to Kindle publishers who agree to certain conditions. Some of these conditions, such as the inability to opt out of the lendability feature, have caused some controversy. Concurrently with the Kindle device, Amazon launched Kindle Direct Publishing, where authors and publishers independently publish their books directly to Kindle and Kindle Apps worldwide. In open beta testing as of late 2007, the platform has been promoted to established authors by an e-mail and by advertisements at Amazon.com. Authors can upload documents in several formats for delivery via Whispernet and charge between $0.99 and $200.00 per download. These documents may be written in 34 languages. As of March 2012 Kindle store offers over 200 items labeled as active content. These items include simple applications and games, including a free set provided by Amazon Digital Services. As of 2012, the active content is only available in the US (or users with a US billing address). The KDK is based on the Java programming language, specifically, the Personal Basis Profile 1.1.2 (JSR 217) flavor of packaged Java APIs. On January 21, 2010, Amazon announced the forthcoming release of its Kindle Development Kit. It aims to allow developers to build 'active content' for the Kindle, and a beta version was announced with a February 2010 release date. A number of companies have already experimented with delivering active content through the Kindle's bundled browser, and the KDK promises 'sample code, documentation and the Kindle Simulator' together with a new revenue sharing model for developers. Kindle devices may report information about their users' reading habits "such as up-time [and] last page read" to Amazon. The Kindle stores the last page read and it may store annotations, highlights and markings for Amazon ebooks and it is unclear if this data is stored for non-Amazon ebooks. The original Kindle and Kindle 2 did not allow the user to organize books into folders. The user could only select what type of content to display on the home screen and whether to organize by author, title, or download date. Kindle software version 2.5 (released July 2010) allowed for the organization of books into "Collections" which behave like non-structured tags/labels: a collection can not include other collections, and one book may be added to multiple collections. These collections are normally set and organized on the Kindle itself, one book at a time. The set of all collections of a first Kindle device can be imported to a second Kindle device that is connected to the cloud and is registered to the same user; as the result of this operation, the documents that are on the second device now become organized according to the first device's collections. calibre had a plugin that made it possible to organize these collections on a computer, but this plugin no longer functions on newer models such as the Kindle Touch and Kindle Fire. There remains no option to organize by series or series order, as the AZW format does not possess the necessary metadata fields. Amazon offers an email-based service that will convert GIF, PNG, and BMP graphics to AZW. Amazon will also convert HTML pages and Microsoft Word (DOC or DOCX) documents through the same email-based mechanism, which will send a Kindle-formatted file to the device via 3G for $0.15 per MB or via Wi-Fi for free. In addition, this service can send unprotected Mobi files to a user's Kindle. These services can be accessed by Kindle devices, iOS devices running Kindle app version 2.9 or greater, and Android devices running Kindle app version 3.5 or greater. The fourth/fifth generation Kindles, Kindle Touch, and Kindle Paperwhite (1st and 2nd generation) can display AZW, AZW3, TXT, PDF, unprotected MOBI, and PRC files natively. HTML, DOC, DOCX, JPEG, GIF, PNG, and BMP are usable through conversion. The Touch and Touch 3G can also play Audible Enhanced (AA, AAX) and MP3 files. Amazon added in 2012 an update to the fourth generation Kindles to support the AZW3 format. The Kindle 2 added native PDF capability with the version 2.3 firmware upgrade. Earlier versions could not generally read PDF files, but Amazon provided "experimental" conversion to the native AZW format, with the caveat that not all PDFs may format correctly. The Kindle 2 added the ability to play the Audible Enhanced (AAX) format, but dropped the ability to read Audible versions 2 and 3. The Kindle 2 can also display HTML files stored on the unit. The first-generation Kindle can read only unprotected Mobipocket files (MOBI, PRC), plain text files (TXT), Topaz format books (TPZ), and Amazon's AZW format. The Kindle Fire introduced the "Kindle Format 8" (KF8), better known as AZW3. AZW3 supports a subset of HTML5 and CSS3 features, while also acting as a container for a backwards-compatible MOBI content document. The first Kindle devices used the AZW e-book format, which is identical to the Mobipocket (MOBI) format for files that are not DRM-restricted. Kindle devices do not support the EPUB file format used by many other e-book readers. Instead, they are designed to use Amazon's own e-book formats: AZW, and, in fourth generation and later Kindles, AZW3, also called KF8. Like EPUB, these formats are intended for reflowable, richly formatted e-book content and support DRM restrictions, but unlike EPUB, they are proprietary formats. Free software such as the free and open source calibre, Amazon's KindleGen, and the email based Send-to-Kindle service are available to convert e-books into these formats. Kindle devices can also display some generic document formats such as plain text (TXT) and Portable Document Format (PDF) files; however, reflowing is not supported for these file types. Operating system updates are designed to be received wirelessly and installed automatically during a period in sleep mode in which Wi-Fi is turned on. Kindles are charged using either a computer's USB port or an AC adapter. The Kindle also contains experimental features such a basic web browser. Users can also play MP3 music in the background, if the device supports MP3 playback. As a member of Amazon Prime, access to the "Kindle Owners' Lending Library" is given that allows Kindle-owning members to borrow one free ebook, from over 600,000 titles, per calendar month. In July 2014, Amazon added a Kindle Unlimited subscription, which allows unlimited access to over 638,000 titles and 7,000 audiobooks for a monthly fee. The device is sold with electronic editions of its owner's manual; the U.S. version also includes the New Oxford American Dictionary and the UK version, the Oxford Dictionary of English (not to be confused with the Oxford English Dictionary). Users can purchase different dictionaries from the Kindle store as specified in the included manual. Public libraries that offer books via OverDrive, Inc. also loan titles for the Kindle and Kindle reading apps. Books are checked out from the library's own site, which forwards to Amazon for the completion of the checkout process. Amazon then delivers the title to the Kindle for the duration of the loan, though some titles may require transfer via a USB connection to a computer. If the book is later checked out again or purchased, annotations and bookmarks are preserved. In addition to the Kindle store, paid content for the Kindle can be purchased from various independent sources such as Fictionwise, Mobipocket, and Baen Ebooks. Public domain titles are also obtainable for the Kindle via content providers such as Project Gutenberg, The Internet Archive, Retroread, and World Public Library. In 2011, the Kindle store had more than twice as much paid content as its nearest competitor, Barnes and Noble. International users of Kindle pay different prices for books depending on their registered countries. For U.S. customers traveling abroad, Amazon originally charged a $1.99 fee to download books over 3G while overseas. That charge was quietly dropped in May 2010. Fees remain for wireless delivery of periodical subscriptions and personal documents. In late 2007, new releases and New York Times best sellers were being offered for approximately $11, with first chapters of many books offered as free samples. Many titles, including some classics, are offered free of charge or at a low price, which has been stated to relate to the cost of adapting the book to the Kindle format. Magazines, newspapers and blogs via RSS are provided by Amazon per a monthly subscription fee or a free trial period. Newspaper subscriptions cost from $1.99 to $27.99 per month; magazines charge between $1.25 and $10.99 per month, and blogs charge from $0.99 to $1.99 per month. Amazon e-book sales overtook print for one day for the first time on Christmas Day of 2009. Content from Amazon and some other content providers is primarily encoded in Amazon's proprietary Kindle format (AZW, KF8). It is also possible to load content in various formats from a computer by transferring it to the Kindle via a USB cable or by emailing it to a registered email address provided by Amazon (for a fee via 3G, or free via Wi-Fi); the email service can convert a number of document formats to Amazon's AZW format and then transmit the result to the associated Kindle over Whispernet. Amazon also has an application and browser extension called "Send to Kindle," which users can use to convert a web page to a format that can be read on Kindle. In addition to published content, Kindle users can also access the Internet using the experimental web browser, which uses NetFront. In December 2011, Amazon announced that customers had purchased "well over" one million Kindles per week since the end of November 2011; this includes all available Kindle models and also the Kindle Fire tablet. IDC estimated that the Kindle Fire sold about 4.7 million units during the fourth quarter of 2011. Pacific Crest estimated that the Kindle Fire models sold six million units during Q4 2012. In 2010, Amazon remained the undisputed leader in the e-reader category, accounting for 59% of e-readers shipped, and it gained 14 percentage points in share. According to an International Data Corporation (IDC) study from March 2011, sales for all e-book readers worldwide reached 12.8 million in 2010; 48% of them were Kindles. On April 17, 2014, Samsung announced it would discontinue its ebook store effective July 1, 2014 and would partner with Amazon for the Kindle for Samsung app, which would permit Samsung Galaxy users using Android 4.0 or higher to use Amazon’s catalog, and would add a free book service, Samsung Book Deals, that would allow users of the app to choose one free ebook monthly from a selection provided by Amazon. Amazon released a "Kindle for PC" application in late 2009, available as a free download for Microsoft Windows 8, 7, Vista, and XP. This application allows thousands of books to be read on a personal computer in color, with no Kindle unit required, as e-books can simply be purchased from Amazon's store. Amazon later released a version for the Apple Macintosh, in early 2010. In June 2010, Amazon released a "Kindle for Android" version. With the Google Android application release, versions for the Apple iPhone, the iPad, Windows and Mac computers, and BlackBerry cellphones are also available. In January 2011, Amazon released Kindle for MS Windows Phone 7. In July 2011, Kindle for HP TouchPad (running under webOS) was released in the US as a beta version. In August 2011, Amazon released an HTML5 based webapp supporting the Chrome, Firefox and Safari browsers called Kindle Cloud Reader. As of 2013, Amazon has expressed no interest in releasing a separate application for the GNU/Linux operating system; however, the Cloud Reader can be used in Linux using the browser. The Kindle Fire HDX, announced on September 25, 2013, is the third generation of Amazon's Kindle Fire tablet line. It is available in 7 inch and 8.9 inch screen sizes, with introductory prices of $229 and $379, respectively, for the 16 GB version with special offers. Both tablets are also available in 32 and 64 GB versions. In the 2014 refresh of the tablet, it was renamed Fire HDX removing the name Kindle; this name change was included in all 2014 Fire tablets. The Kindle Fire HD, announced on September 6, 2012, is the second generation of Amazon's color touchscreen Kindle Fire tablet line. It is available in two form factors, 7 in and 8.9 in screen sizes. Introductory pricing was at $199 and $299, respectively for the 16 GB versions; both Fire HD were sold at cost. The 7 in version was released on September 14, while the 8.9 in model (with either Wi-Fi or 4G model) was released on November 20, 2012. In October 2013, the Fire HD 7 in was refreshed using the Fire HDX unibody and had its price reduced to $139. In October 2014, Amazon released a refreshed Fire HD in 6-inch and 7-inch sizes. Amazon announced Kindle Fire, an Android-based tablet that uses a fork of Android called Fire OS 1 on September 28, 2011. It was released for $199 and has a 7 in IPS color touchscreen display. This was the first Kindle without an E Ink display. However, unlike previously released Kindles, it has no 3G option, but only Wi-Fi. It has 8 GB of storage and a projected battery life of up to eight hours. In September 2012, the Kindle Fire was refreshed to have more RAM, a faster processor, an updated OS, and price reduced to $159. The Kindle Voyage sold by Amazon China has a "special limited edition" cased in a gift box with add-ons of a power adapter, a leather protective cover and a 100-yuan gift card. The Kindle Voyage was released on October 21, 2014 in the United States. It has a 6-inch, 300 PPI display (the highest resolution available in e-readers as of 2014) with adaptive LEDs to illuminate the screen depending on the environment, and has 4GB of storage (3GB usable). It is available in Wi-Fi ($199 ad-supported, $219 no ads) and Wi-Fi + 3G ($269 ad-supported, $289 no ads) models. It features a new design of flush glass screen and rear power button, similar to the Kindle Fire HDX. The Voyage uses a new method of turning pages, called 'PagePress'. There are sensors on either side of the screen and if pressed it turns the page. PagePress can be disabled, but touchscreen page turns cannot be turned off since the touchscreen is the UI. Amazon claims it has 6 weeks of life if used for 30 minutes a day with wireless disabled and brightness set to 10, this means 21 hours of use. Amazon announced a new upgraded basic Kindle and the new Kindle Voyage on September 18, 2014. The basic Kindle 6 was released on October 2, 2014 ($79 ad-supported, $99 no ads). It is the first basic Kindle to use a touchscreen for navigating books, and there is no longer a touchscreen-less Kindle choice. It is the first basic Kindle available in international markets such as Japan and China. Engadget gave the Paperwhite 2 a 93 out of 100, saying while the "all-new" Paperwhite does not offer many new features compared to the original model, but "an improved frontlight and some software tweaks have made an already great reading experience even better." The Kindle Paperwhite 2 was released in most major international markets by the middle of 2014 and this released model includes 4GB of storage. As of September 2014, the US version of the Paperwhite 2 includes 4GB of storage. The Paperwhite 2 uses the same experimental web browser with the same 3G data usage restrictions as previous Kindles; there are no usage restrictions when using Wi-Fi. The official leather cover for the Paperwhite 2 is the same item as was used for the original Paperwhite. It turns the screen on or off when it is opened or closed. The Paperwhite 2 features a higher contrast E Ink Carta display technology, improved LED illumination, 25% faster processor (1 GHz) that allows for faster page turns, and better response to touch input compared to the original Paperwhite. It has the same 6" screen with 212 PPI and bezel as the original Paperwhite. The software features dictionary/WorldHeritage/X-Ray look-up, Page Flip that allows the user to skip ahead or back in the text in a pop-up window and go back to the previous page, and Goodreads social integration. Amazon announced the Kindle Paperwhite (2nd generation), marketed as the "All-New Kindle Paperwhite" and colloquially referred to as the Paperwhite 2, on September 3, 2013; the Wi-Fi version was released in the USA on September 30, 2013 ($119 ad-supported, $139 no ads), and the 3G/Wi-Fi version was released in the USA on November 5, 2013 ($189 ad-supported, $209 no ads). Engadget praised the Paperwhite, giving it a 92 out of 100. The reviewer liked the front-lit display, high contrast, and useful software features, but did not like that it is less comfortable to hold than the Nook, the starting price includes ads, and it has no expandable storage. The Kindle Paperwhite was released in most major international markets in early 2013, with Japan's version including 4GB of storage, and in China on June 7, 2013.